This season, bass-baritone Christian Van Horn returns to the Lyric Opera of Chicago for La Cenerentola and Roméo et Juliette, the Metropolitan Opera for La Bohéme, and the Canadian Opera Company for Carmen. He also makes his debut at Rome Opera in Linda di Chamonix. Mr. Van Horn has appeared in many of the great opera houses of the world including the Metropolitan Opera, Lyric Opera of Chicago, San Francisco Opera, Santa Fe Opera, Los Angeles Opera, Canadian Opera Company, Bayerische Staatsoper, Stuttgart Opera, Grand Théâtre de Genève, and Netherlands Opera, and at the Salzburg and Munich festivals. His many roles include the title role in Le nozze di Figaro, Colline in La bohéme, Alindoro in La Cenerentola, Timur in Turandot, Banquo in Macbeth, Oroveso in Norma, Zaccaria in Nabucco , the Four Villains in Les Contes d'Hoffmann, Escamillo in Carmen, Gessler in Guillaume Tell, and Frère Laurent in Roméo et Juliette. He also appeared in the world premieres of Tan Dun’s Tea: A Mirror of the Soul at the Santa Fe Opera and Marco Tutino's Two Women at the San Francisco Opera. In concert, Mr. Van Horn has appeared at the at the Salzburg Festival Easter Festival with the Berlin Philharmonic and Sir Simon Rattle, at Carnegie Hall in a concert programmed by the Emerson String Quartet as part of their Perspective Series, and in performances of Tippet’s Child of Our Time with the Chicago Symphony (with Sir Andrew Davis), Beethoven Symphony No. 9 with the LA Phil, and the opening concerts of the Bard Music Festival. Mr. Van Horn recorded the title role of Le nozze di Figaro for SONY Classical. He also recently appeared in the Metropolitan Opera's HD broadcast of Falstaff. Mr. Van Horn received his Master’s degree in music from Yale University and is a graduate of the Lyric Opera Center for American Artists at the Lyric Opera of Chicago. His numerous awards include winner at the 2003 Metropolitan Opera National Council Auditions, a 2003 Sarah Tucker Study Grant, first place at the 2002 MacAllister Competition Collegiate Division, prize winner in the 2002 Liederkranz Foundation Vocal Competition, and the Richman Award from Opera Theatre of St. Louis. In addition to the release of Sony Classical's Figaro, Christian Van Horn can also be heard on several previously-released commercial recordings. These include Bizet's Carmen with Sir Simon Rattle and the Berlin Philharmonic for EMI, Wagner's Rheingold with Simon Rattle and BR Orchestra, a live recording of Beethoven's Ninth Symphony with Leon Botstein and the American Symphony Orchestra, and the world premiere of David Carlson's Anna Karenina for Signum Classics with the St. Louis Symphony Orchestra and Maestro Stewart Robertson. 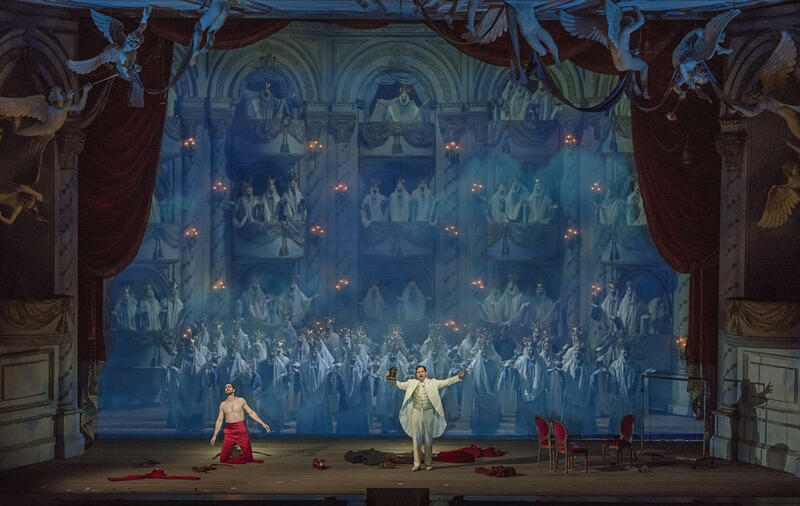 Christian may be seen on DVD in the Salzburg Festival's production of Roméo et Juliette, conducted by Yannick Nezet-Seguin (Deutsche Grammaphon) as well as in Christoph Loy's production of Lucrezia Borgia with the Bayerische Staatsoper for Medici Arts. Other past season highlights have included appearances with the Santa Fe Opera, Boston Lyric Opera, Florida Grand Opera, Oper Stuttgart, Chicago Opera Theater, and the Seattle Symphony, to name a few. Mr. Van Horn holds both a Master of Music and an Artists Diploma in Voice and Opera from Yale University where he studied with Richard Cross. Christian was a member of the Ryan Opera Center for two years with Lyric Opera of Chicago and spent two seasons on the ensemble roster of the Bayerische Staatsoper. He is originally from Long Island, New York, and currently makes his home between engagements near Richmond, Virginia. Christian Van Horn is represented by Caroline Woodfield of Opus 3 Artists.